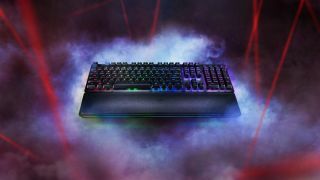 Not satisfied with the myriad key switches available for gaming keyboards today, Razer has developed another of its very own for two brand new products: Razer Huntsman and Huntsman Elite. But, those aren’t even the marquee features of these new keyboards. That has to be Razer’s very own key switch that it calls ‘opto-mechanical’. If you hadn’t already guessed, the switch works through optics. Specifically, underneath each switch is an infrared light beam that is claimed to precisely detect the actuation of key presses at a 1.5mm actuation point, as opposed to most other gaming keyboards that use mechanics to do the same thing. Razer says that, because these switches actuate at ‘the speed of light,’ they’re 30% faster than traditional mechanical key switches. Not only that, but Razer says that these keys require a lighter actuation force of 45g than its previous Razer Green mechanical switches. Finally, because these switches feature fewer mechanics, the opto-mechanical switch is rated for up to 100 million key presses – that’s double the reliability of proper mechanical switches, according to Razer. Will beams of light turn out to be better than mechanical key switches in the end? You’ll have to wait for our full Razer Huntsman Elite review for that answer. The Razer Huntsman and Huntsman Elite gaming keyboards are available now on Razer’s website for $149 / AU$249 (about £119) and $199 / AU$339 (about £159), respectively.